Published: Jan. 31, 2018 at 02:12 p.m. Updated: April 2, 2018 at 10:18 a.m.
NFL Commissioner Roger Goodell announced Wednesday the Kansas City Chiefs will play the Los Angeles Rams in Mexico City next season. "Over the past two seasons, we have seen the extraordinary passion that exists for NFL football in Mexico," Goodell said in a statement. "We are excited for another memorable event at Estadio Azteca as the Los Angeles Rams and Kansas City Chiefs head to Mexico City in 2018." The date and time for the game will be announced later this offseason. On the heels of successful games in Mexico in 2016 and 2017, the NFL and Mexico's Ministry of Tourism announced a three-year agreement in November to play regular-season games in the country through 2021. 77,000 fans attended November's New England Patriots-Oakland Raiders game in Mexico City this season. The game in Mexico is the fourth international game confirmed for 2018 -- three games will be played in London next season, too. "Southern California and Mexico share strong historic and cultural ties and this game will provide an opportunity to celebrate the special connection between these two regions," Rams owner Stanley Kroenke said. "It is great to be participating in the NFL's international games again and working with the league to grow the game abroad. Mexico has one of the largest NFL fan bases in the world and we are excited to bring Rams football to the millions of fans there." For the Chiefs, it'll be the franchise's first regular-season game in Mexico. The team played a preseason contest in Monterrey, Mexico, in 1996. "We are thrilled to be a part of the NFL's international initiatives once again, and we are excited to face the Rams at historic Estadio Azteca this fall," said Chiefs owner Clark Hunt. "The support for the NFL in Mexico has grown significantly since our initial trip in 1996. We look forward to returning to Mexico and connecting with a new generation of fans this season." 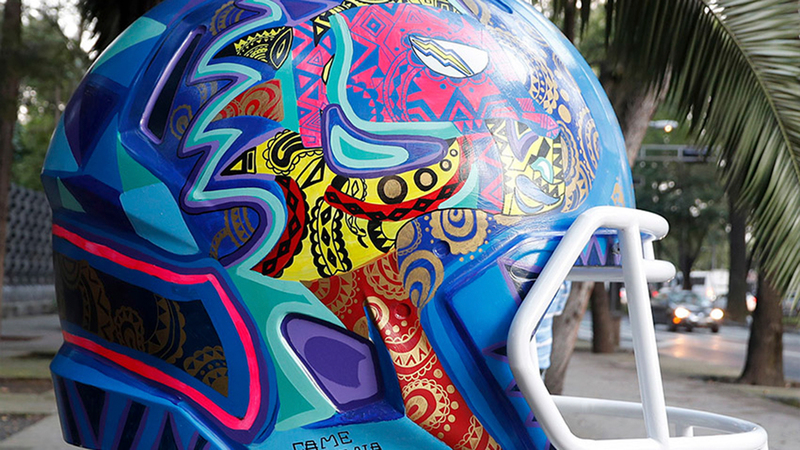 Mexican artists have painted giant football helmet sculptures for all 32 NFL teams as part of a public art exhibit ahead of Texans- Raiders in Mexico City. See all 32 helmets here.